Video of a helicopter ride to the Lendbreen ice patch in 2014, following the route that Dagsgard took in 1974. Per Dagsgard’s original drawing from 1975 of how the spear was found lying in the scree. The spearhead had broken off the shaft (see drawing), so Dagsgard could simply collect the spearhead and put in into his backpack. The shaft was so well preserved, that he could carry it down in his hand. The spear quickly made its way to the archaeological museum in Oslo. 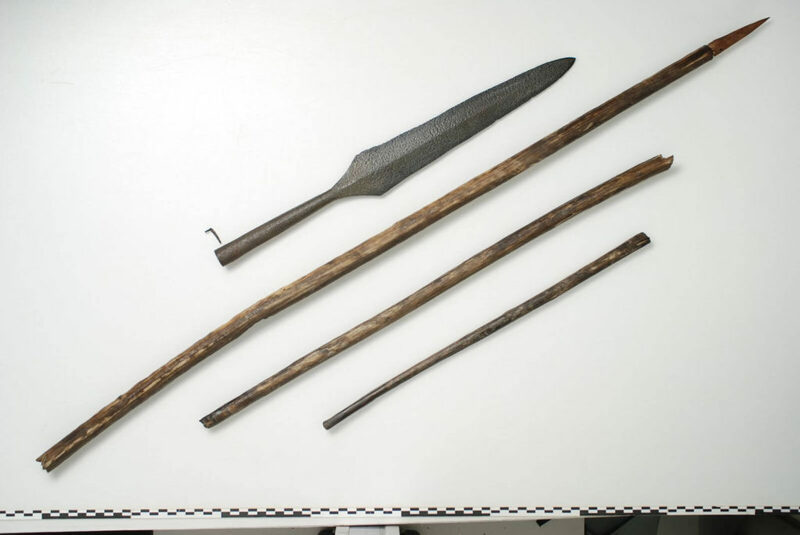 Professor Sverre Marstrander confirmed Dagsgard’s dating of the spear to the Viking Age. Marstrander was interested in knowing if the Lendbreen ice patch (which he calls a glacier; for the difference between the two, read here) had retreated in the years prior to the discovery. Dagsgard confirmed that this was indeed the case. The first museum photo of the spear (C34256), probably taken 1974 or 1975. Photo: Ørnulf Hjort-Sørensen, Universitetets Oldsaksamling. Scale is 1 m.
For many years, this was where the story of the Lendbreen spear ended. It was considered a unique and lucky find due to chance preservation by the ice. Remember, this was more than 20 years before glacial archaeology was born as an archaeological discipline after the finds boom from the ice patches in Yukon (for the history of glacial archaeology, read here). Finds from the ice had been known in Norway since the 1930ies (especially from Oppdal), but ice finds from Oppland were still rare in 1974. It is interesting to note that Dagsgard also reported other finds from Lendbreen (such as sled remains and scaring sticks) in his letters to the museum, to which he got no response. Maybe the archaeologists thought these objects were of a more recent date. 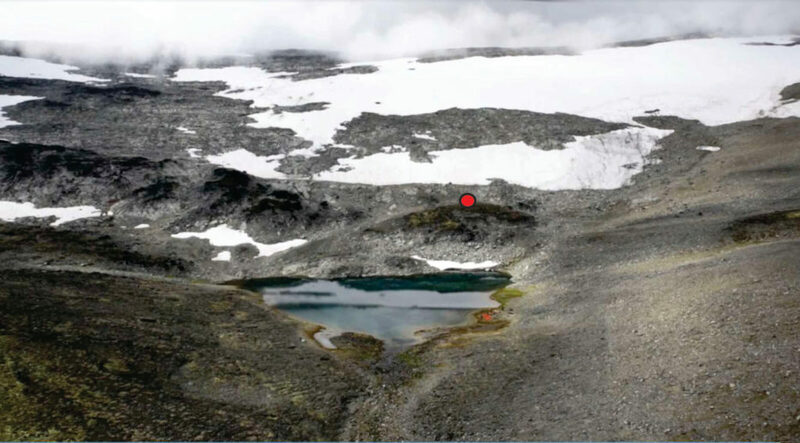 If they had checked up on these finds, the glacial archaeology of Oppland could have started 30 years earlier than it did. The iron spearhead. Photo: Vegard Vike, Museum of Cultural History. 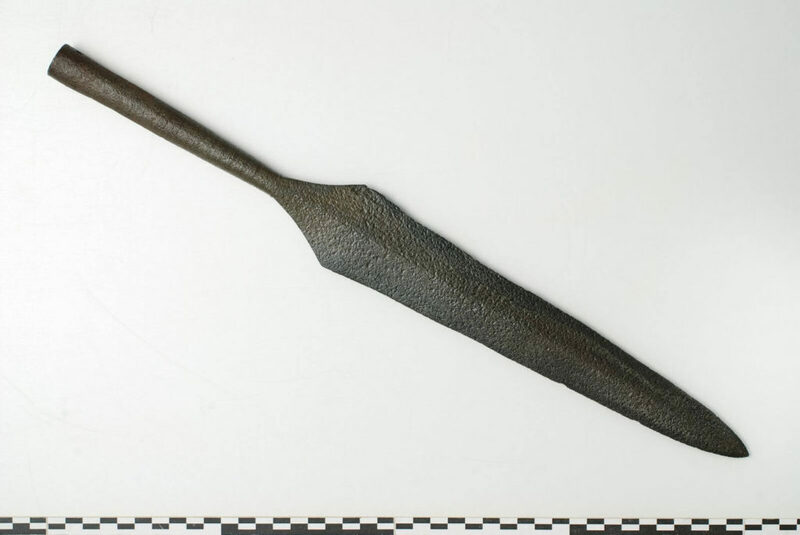 The spear from Lendbreen has a 45.5 cm long iron spearhead. The length of the blade is 31 cm, and the largest width is 5.3 cm. The spearhead is of Jan Petersen type F, dating the spear to the period AD 825-950. The blade is simple without inlay or traces from damascene. The socket has grooves. At the end there is a hole for the nail attaching the shaft to the socket. Remarkably, the small iron nail is also preserved. The socket, the nail and the broken off top of the shaft. The grooves on the socket are clearly visible. Photo: Vegard Vike, Museum of Cultural History. The shaft is made of birch. It measures 185 cm in length. The pointed end found inside the socket measures an additional 8.5 cm. The shaft diameter is now c. 22 mm at the widest, and thinning towards the proximal end. Wood sometimes shrinks a bit during the freeze-drying processes that happens at the ice, so that shaft diameter may have been a bit larger originally. From the earliest photo at the museum, we can see that the shaft has a curve to it. This is not the original shape, but probably caused by snow pressure on the artifact. This is a well-known phenomenon in glacial archaeology. The complete spear. The shaft is now in three pieces. It is not known why it has been broken up while at the museum, only that this happened before 1989. Photo: Vegard Vike, Museum of Cultural History. The total length of the spear is 230.5 cm, which is perhaps somewhat shorter than expected for a spear. However, knife marks at the bottom end of the shaft clearly show that the shaft has not broken off here. Before trying to understand why the spear was lost at Lendbreen, one question needs to be answered first: Are the find spot and the place it was lost identical? Artifacts from the ice are often displaced by moving ice, meltwater and/or wind. Photo of find spot (marked in red), taken in 2014. The Lendbreen ice patch is now much smaller than when the spear was discovered in 1974. At that time, the light grey areas were still covered with ice and snow. The tents in the basecamp for the 2014 fieldwork are just visible on the right side of the lake. Photo: Secrets of the Ice/Oppland County Council. The spear was found at the foot of the ice patch. It is too heavy to have been moved by wind and there is little evidence of ice movement in this section of Lendbreen. That leaves us with downslope transport by meltwater as the only displacement factor. 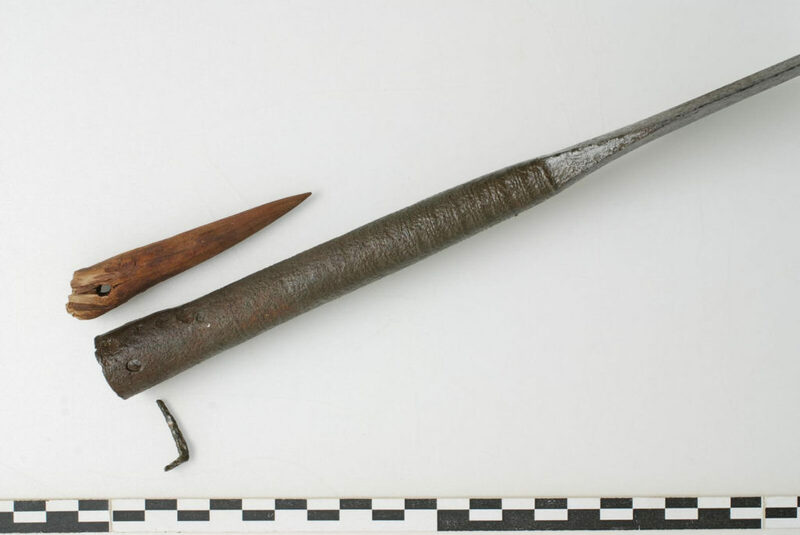 However, the spear was in excellent condition when found, unlike the poorly preserved and displaced material otherwise found in the slopes or at the bottom of Lendbreen. This makes downslope transport less likely, at least not over a long distance. The spear was probably lost where it was found or in the near vicinity. The Mystery: Why Was the Spear Lost? Understanding why the spear was lost is confounded by Lendbreen being a dual-purpose site, used for both hunting and transport. Nearly all of our other 50 sites are pure hunting sites. Had the spear been found on one of those sites, a hunting context for the spear would have been a straightforward explanation. Based on the two different uses of Lendbreen ice patch, there are two possible explanations for the presence of a spear here. We can call them the hunter or the warrior hypothesis. Was the spear used for hunting reindeer? The use of spears for hunting is well known from different parts of the world. However, it would be the only known example of the use of a spear for reindeer hunting on ice in Norway. Based on the finds from the ice, reindeer were normally hunted using bow-and-arrow. On the other hand, the preserved material could be biased by the fact that arrows are much more easily lost in the snow during hunting than spears are. Is there other evidence in support of the hunter hypothesis? Yes, there is. Lake Lendholtjønne is just below the find spot. Remains of a wooden fence have been found here, which may have been used in the process of driving the reindeer into the lake, where they could have been easily killed by spears. However, the one radiocarbon-date we have of the fence puts it several centuries earlier than the spear. Did the spear belong to a warrior rather than a hunter? The Lendbreen site has quite a number of finds, which are unique to the site, and not found on the pure hunting sites. The Iron Age tunic, the Viking Age mitten, sled remains, and many pieces of cloth, just to mention a few. The spear is also a unique find, and is perhaps better understood in relation to the mountain route crossing Lendbreen, as are the other unique finds on the site. This is also supported by the spearhead type, which is a type generally believed to have been used for close-hand combat, both stabbing and cutting. It is quite broad, and using it for killing reindeer seems a bit over the top. A smaller and narrower spearhead would have been sufficient for that purpose. Why would somebody bring their weapons into the high mountains? This is actually not so surprising, given what we know about Viking culture. In the ancient Edda poem Hávamál, Odin gives advice on proper behavior for Vikings. 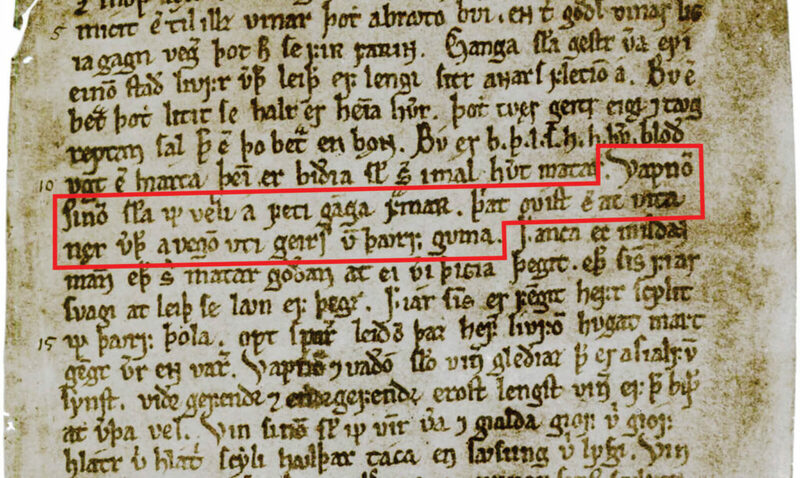 Hávamál is only preserved in one manuscript – the 13th century Codex Regius, a collection of Old Norse poems from the Viking Age. Verse 38 is highlighted here. So, do not leave home without your weapons. You can never know, when you will need them. The high mountains were no exception to this rule. That Vikings abided by this rule is also shown by the recent find of a Viking sword at high altitude here in Oppland. For the moment, we are leaning towards the warrior hypothesis. Then why was it lost? That is a mystery we are currently unable to solve. Maybe the solution to the mystery is still inside the ice, waiting to melt out. Per Dagsgard still lives and works in his native Skjåk. After finding the Viking spear, he has continued to survey for ancient monuments in the mountains. We recently received a long list of sites he has discovered, complete with GPS-coordinates, which was much appreciated by us. Dagsgard has also helped us during our fieldwork at the Lendbreen ice patch and surveyed for new ice sites on his own. So, the discovery of the spear proved to be only the beginning for Dagsgard’s lifelong historical quest. How can you not get hooked on history after starting out by making such a magnificent archaeological discovery? 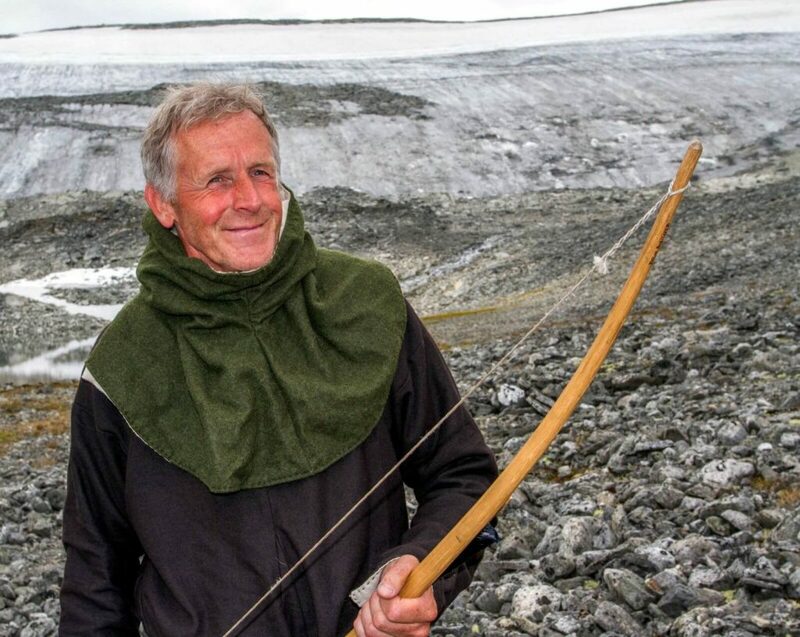 Per Dagsgard in 2010, during the filming of a hunting reconstruction scene at Lendbreen, 36 years after he discovered the spear below the ice in the background. Photo: Espen Finstad, Secrets of the Ice/Oppland County Council.